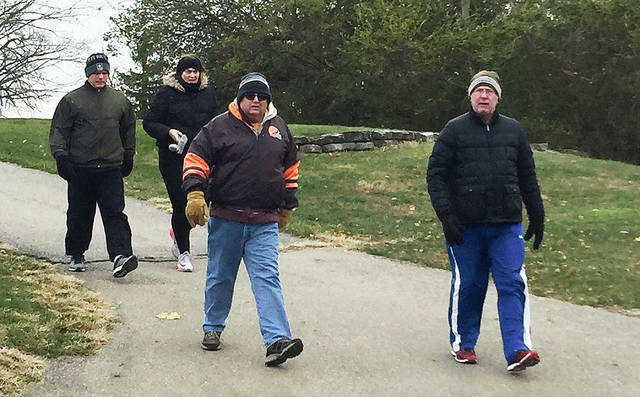 Photo Provided A group of walkers enjoy the weather at the 5K walk for the Wounded Warriors Project at Echo Hills. 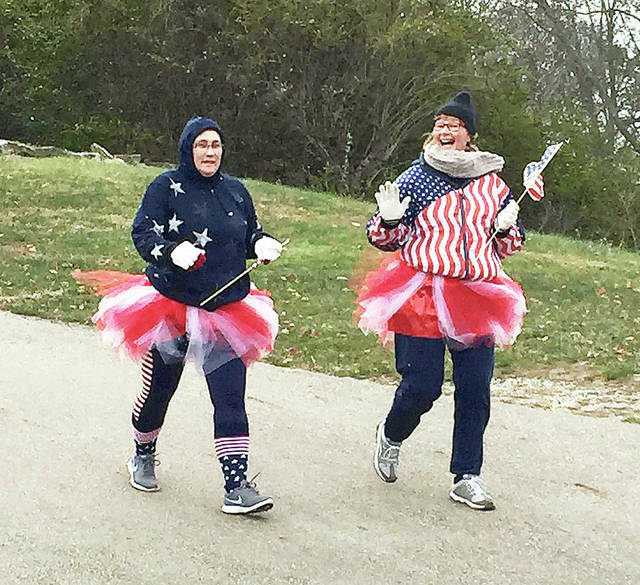 Photo Provided Randi and Carolyn Pearson braved the cold weather for the 5k walk for the Wounded Warriors Project at Echo Hills. Photo Provided Two walkers show off their colors during the 5K walk for the Wounded Warriors Project at Echo Hills. Echo Hills held a 5K walk for the Wounded Warriors Project last Saturday. Here is a letter from Echo Hills PGA Professional Chip Fox thanking everyone. 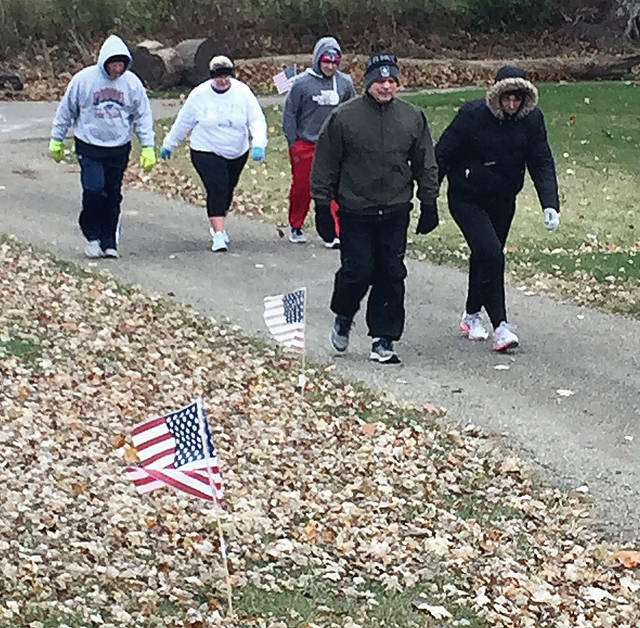 On Saturday November 10th, Echo Hills golf course held its seventh annual 5K run/walk to honor our veterans and to benefit the Wounded Warriors Project. This was the fifth year that we added a run along with the walk. Although the turnout was not what I wanted, we had many who took part in the chilly and windy morning. I would like to thank everyone who helped make this event a success including all that braved the bitter cold and ran or walked. I would like to thank the City of Piqua for allowing me to use Echo Hills golf course. The beauty of the course and the challenge of some of the hills make this an enjoyable run/walk for everyone. Next, I would like to thank our own local media; Rob Kiser and the Piqua Daily Call for helping spread the word. I would also like to thank the VFW and The American Legion for purchasing the T shirts. Thanks to Gail, Scott and Kyle Reardon of Atlantis Sportswear for all the help with the shirts. Those that ran/walked in the 5K enjoyed the golf course decorated in American flags along the course. These flags were donated by Kathy Henne of Re/Max Finest. I would also like to thank Rene Copsey for all the great art work on the signage and posters that were put up here at the course and a select few places downtown. Also thank you to Mulligan’s Pub and Miami Valley Steel for sending participants or helping with a donation. Once again Cindy and Ron Pearson have made this an easy task with all of their dedicated work. Because of their tireless effort we are able to send $1635 to the Wounded Warriors Project so thank you Ron and Cindy and everyone who participated. Lastly I want to thank all the Veterans and all the men and women serving our country today and a personal thank you to SSG Brian Crawford for allowing us to fly his American flag that was flown in Afghanistan in 2012. If anyone is interested in purchasing this year’s 100 year celebration shirt or any of the past year’s shirts they will be on sale here at Echo Hills golf course until they are gone. Shirts range in price from $3 to $20. Next year we will still be doing a 5K run/walk but the money collected will be given to local Veterans groups. I hope to see everyone next year on November 9th. https://www.dailycall.com/wp-content/uploads/sites/30/2018/11/web1_IMG_1323.jpgPhoto Provided A group of walkers enjoy the weather at the 5K walk for the Wounded Warriors Project at Echo Hills. 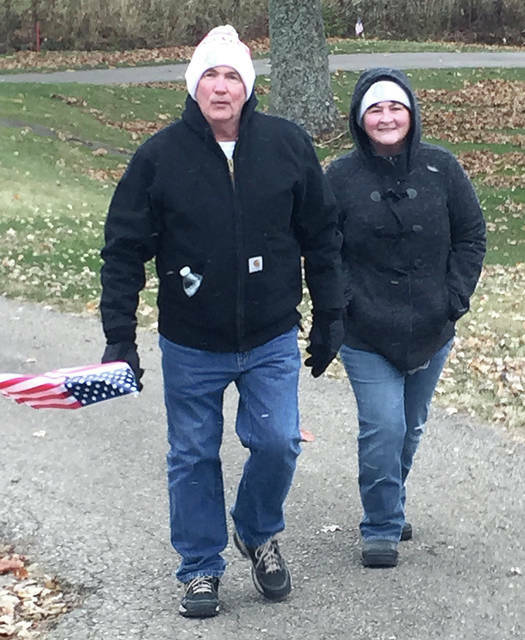 https://www.dailycall.com/wp-content/uploads/sites/30/2018/11/web1_IMG_1315-1.jpgPhoto Provided Randi and Carolyn Pearson braved the cold weather for the 5k walk for the Wounded Warriors Project at Echo Hills. 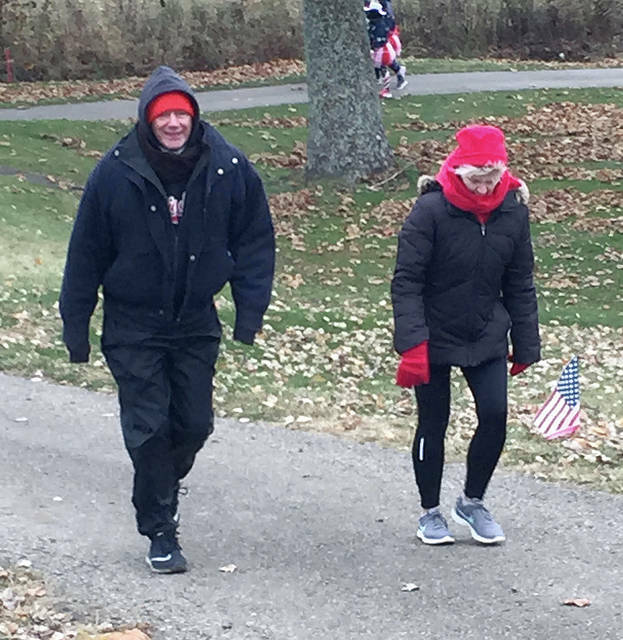 https://www.dailycall.com/wp-content/uploads/sites/30/2018/11/web1_IMG_1329.jpgPhoto Provided Two walkers show off their colors during the 5K walk for the Wounded Warriors Project at Echo Hills.